The US Supreme Court today rejected a request from lawyers acting on behalf of Ed Moloney and Anthony McIntyre to hear their appeal against a lower court’s refusal to grant them standing in legal efforts to resist an attempt by the Police Service of Northern Ireland to gain access to IRA interviews archived at Boston College. We began this fight almost exactly two years ago and all along the campaign has run on two tracks, one legal, the other political. The legal track has almost come to an end but the political campaign continues. In recent weeks the United States government has been made aware of just how damaging to the political situation in Northern Ireland these interviews could be and how this PSNI request has both dubious motives and derives from a broader failure of the parties in the North to agree on a way to deal with the past in such a way as to allow the future to begin. A few days ago the chairman of the Senate Foreign Relations Committee, Senator Robert Menendez issued a statement in the form of a letter to Secretary of State John Kerry whose significance has gone largely unnoticed by the media. In that letter he referred to the United States’ role as “a steward” of the peace process in Northern Ireland while noting the potential of this PSNI action to “re-open fresh wounds and threaten the success of the Good Friday Accords”. We warmly welcomed Senator Menendez’ letter and hope and trust that Secretary Kerry will in the coming days act on his wise and well-informed advice. This is a very disappointing decision by the Supreme Court but we wish to express our deeply felt gratitude to all those who were involved in the legal campaign, principally our attorneys Eamonn Dornan, JJ Cotter, Jonathan Albano who laboured long and hard in a tenacious and skilled legal battle against the combined legal forces of two governments. They were ably and skillfully assisted by a large number of lawyer colleagues, including members of the ACLU of Massachusetts as well as Cliff Sloan, Bob McDonnell of Bingham McCutcheon, Sarah Wunsch, John Foley, Matt Seagal of the ACLU, Kevin Winters of Belfast, Peter Kissel and Mike Carroll to whom we also send our thanks. All our legal advice was given on a pro bono basis, for which we will be forever grateful. If other names have been omitted by pressure of events we beg indulgence. Amicus briefs were also presented to the Supreme Court in our support by the Reporters Committee for Freedom of the Press, by Article 19 and by a group of professors from Indiana led by our good friend Bob White. We thank them from the bottom of our hearts for their courage and a dedication to principle that was notable elsewhere for its absence. California attorneys, John De Stefano and Mary-Christine Sungaila gave great help in preparing the amicus briefs for which we are deeply indebted. A special mention must be made of the Irish-American groups that came to support the campaign notably the Ancient Order of Hibernians, the Brehon Law Society and the Irish American Unity Conference who worked tirelessly to prevent these interviews from being handed over. We thank them for all their great work. A large number of individuals also gave freely of their support and advice and while all deserved to named we would like to thank in particular Sandy Boyer, Chris Bray, Lin Solomon, Harvey Silverglate, Sabina Clarke, Michael Cummings, Helen McClafferty, Cathleen O’Brien, Jim Lockhart, Tom Burke, Ed Lynch, Tim Miles, John Lowman and Ted Palys. They are just a few of the friendships we have made or cemented during this campaign. We are also deeply indebted to our wives and families for all the loving support they gave us during this stressful period. All of those involved in this campaign can be assured that it is not over yet. 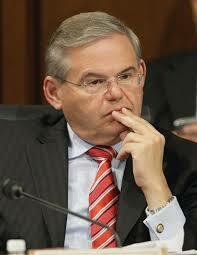 Senator Robert Menendez, the chairman of the Senate Foreign Relations Committee has made a dramatic intervention in the Boston College subpoenas case with a plea to newly appointed US Secretary of State John Kerry to raise the political implications of any handover from the Belfast Project archive of IRA interviews with his counterparts in the British government. Menendez also asks Kerry in the event of the Supreme Court refusing to hear the case brought by Belfast Project director Ed Moloney and researcher Anthony McIntyre that the US government should then “review carefully” any interviews that are subsequently handed over so that their provision “does not undermine the United States’ essential interest” in ensuring that the Good Friday accords are not damaged. This is the first time that the possible handover of interviews from the Boston College archive has been couched in terms of US foreign policy interests by a senior American politician. John Kerry has also gone on record expressing his opposition to any handover of Boston College interviews in a letter written to his predecessor, Hillary Clinton in early 2012. The Supreme Court is due to deliberate this Friday whether or not to hear the Boston College case with an announcement due possibly on Monday. 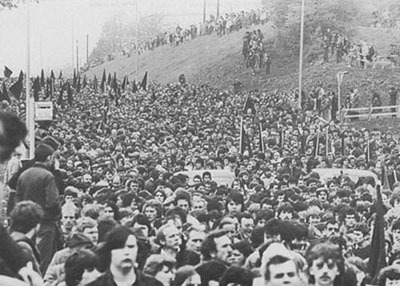 A section of the vast crowd that attended Bobby Sands’ funeral in West Belfast in May 1981. Nine other republican prisoners followed him to early graves. I never liked the tenor of Margaret Thatcher’s voice. It was either too raucous, or too fawning: too rehearsed for my liking. Image, presentation, a certain charisma: the MP for Finchley, I’m convinced, would have made it on the silver screen (but then all politicians are actors, aren’t they?) 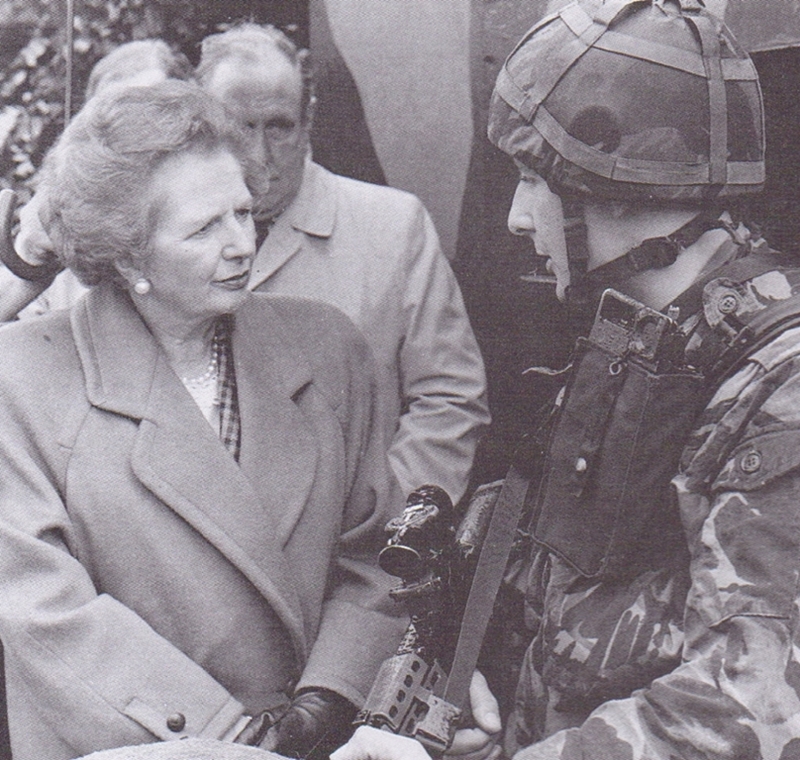 I was fortunate in that my experience of the 1981 IRA/INLA hunger had taught me not to be fooled by her ‘Iron Lady’ image, that The Truculent One was rather more receptive to the sweet scent of common sense than she let on. Gerry Adams said as much in his 1996 autobiography, Before the Dawn when he wrote ‘Margaret Thatcher presented a public face as the Iron Lady who was “not for turning”, yet she was no stranger to expediency.’ Mr. Adams went on to refer to him seeing a draft of a speech that Mrs. Thatcher intended to make at imminent international conference in Ottawa, where she hoped to announce an end to the hunger strike. For that to happen though, she had to persuade Mr. Adams and his committee of political colleagues and advisers to accept a set of proposals that she had sent them on 4 July 1981 and which they had rejected. 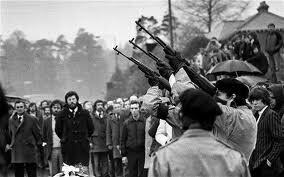 At that point there had been four deaths in the blocks but Mr. Adams and Co. spurned the British prime minister’s offer, the hunger strike continued, and accordingly another six hunger strikers lost their lives. It is now eight years since my book Blanketmen and three years since my second book, Afterlives were published. For seven of those eight years I have had the fight of my life with Gerry Adams and his acolytes. Throughout I have stood by the assertion that the British government had made a substantial offer on 4 July 1981, which was rejected by the committee – against the wishes of the prison leadership, of which I was a part. Furthermore, I said that the committee did not make the hunger strikers aware of the particulars of the Brit offer. On both accounts the hard evidence has shown that I was telling the truth. My vindication has come via a tortuous process of British government Freedom of Information requests, the release of thirty-year British government documents, the verbal and written testimony of the intermediary, Brendan Duddy, and the numerous contradictions and evasions from those who tried, unsuccessfully, to cover for the committee. All that remains to be settled is the motivation for the committee’s behaviour. Was it out of its depth in its attempts to outsmart the British? Or was it so intoxicated with the prospect of impending electoral success (in the impending by-election for first hunger striker, Bobby Sands’ seat) that they took a decision to ignore the offer and thence allow for hunger strikers to die? When I sat down to quietly collect my thoughts before I began writing this article, I asked myself a series of questions: what do I want to say about Margaret Thatcher? That I despised the woman? Of course I did. She was no friend of the Irish – much less Irish republicans. She had it in her power to go the clichéd ‘extra mile’, but didn’t. But then: would the extra mile have mattered to Adams and Co.? Margaret Thatcher is dead. 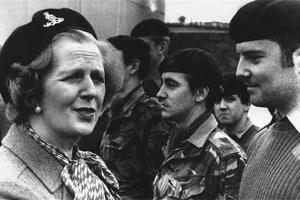 There’ll be no crocodile tears or sugar-coated words from me about the life and times of the Iron Lady. She was our avowed enemy and we expected no quarter from her. Still, we can’t blow back the tide of history and we can’t resurrect our brave, brave hunger strikers. We can, however, treat our own with respect. We can be honest. Our hunger strikers deserve that. If that means Big Gerry and his committee accepting culpability for the deaths of the last six hunger strikers, then so be it. 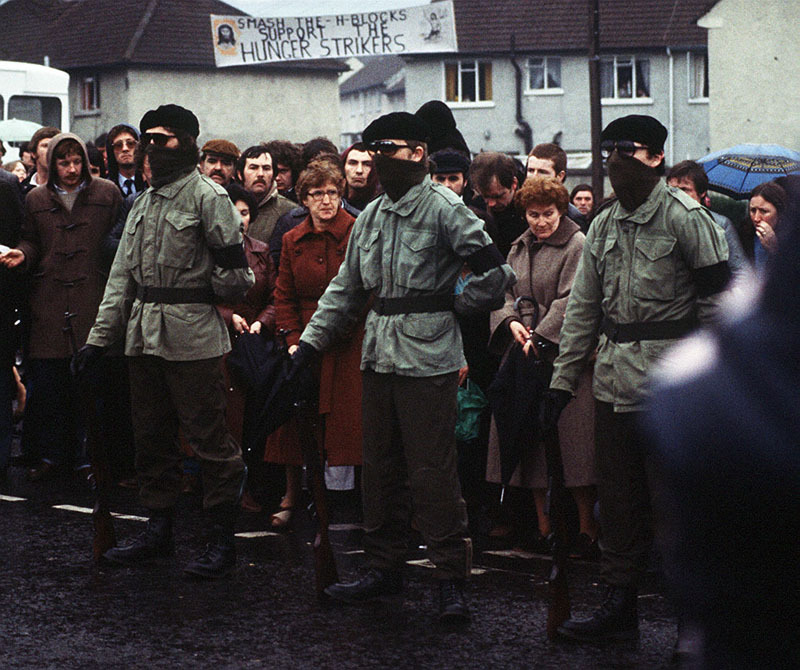 Did Thatcher Kickstart The Peace Process? Within an hour of hearing the news that Maggie Thatcher had died I logged on to Sinn Fein’s website to see what the Provos were saying about the woman and her political legacy. The BBC World Service had made a passing reference to negative comments having been made by Gerry Adams but no more detail than that. Given that she was, at least in popular perception, the most consequential and divisive of British prime ministers during the Troubles in Northern Ireland but that at least part of her story – the bit dealing with the hunger strikes of 1981 – has been considerably revised and challenged in the decades since, I was eager to see just exactly what the Sinn Fein leadership was saying about her. 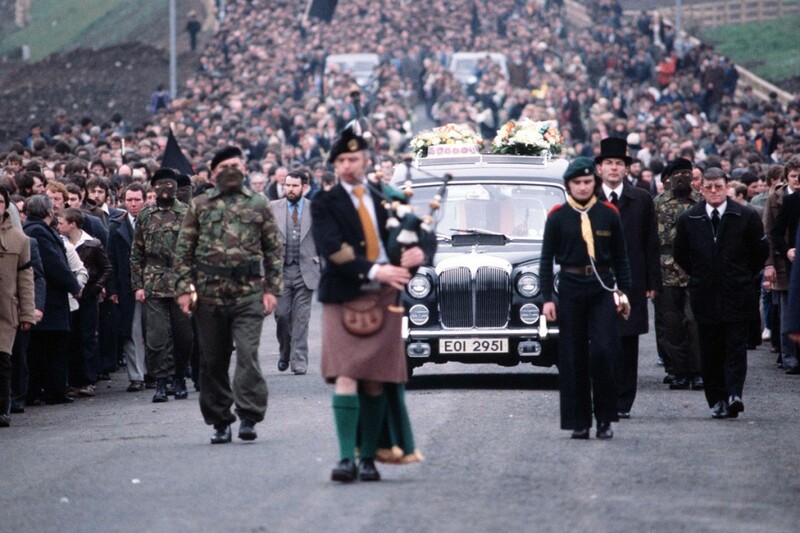 Death of Bobby Sands and other IRA prisoners led to Sinn Fein fighting elections and ultimately to the peace process – did Thatcher make it all possible? It caught my eye because I had to scroll down the page to get to the Adams’ statement and in the process I noticed this headline: ‘Carrier Bag Proposer Welcomes Introduction’. It was a story about how Daithi McKay, a Sinn Fein Assembly member from North Antrim had successfully introduced a new law in the Northern Ireland Assembly at Stormont imposing a levy of five pence on plastic carrier bags supplied by supermarkets. Now don’t get me wrong. 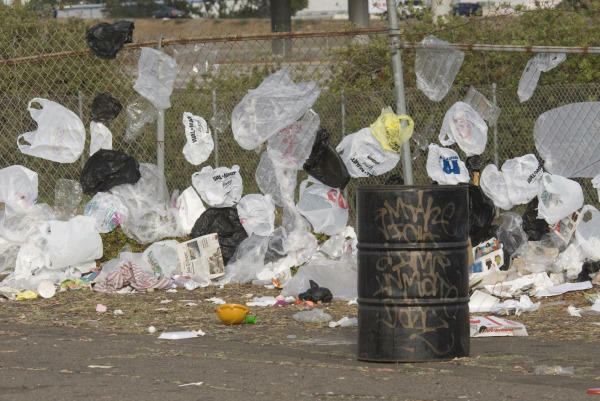 I hate plastic supermarket bags as much as the next man (and I live with someone who insists on hoarding the damn things!) so anything that helps get rid of them must be good. Nothing is more unsightly than this industrial equivalent of tumbleweed; it gets blown everywhere and has an annoying knack of getting caught on wire fences, visually blighting working class housing estates in particular. So fair play to Daithi McKay. But I just couldn’t see how what he had achieved could sit comfortably with Gerry Adams’ claim that Margaret Thatcher’s Ireland policy had failed miserably.